LINQ (Language Integrated Query) is a Microsoft .NET Framework component that adds native data querying capabilities to .NET languages. 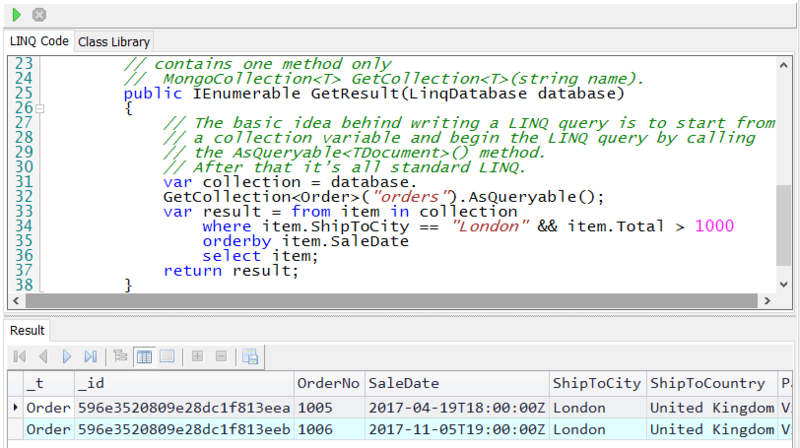 What is LINQ Query Tool? 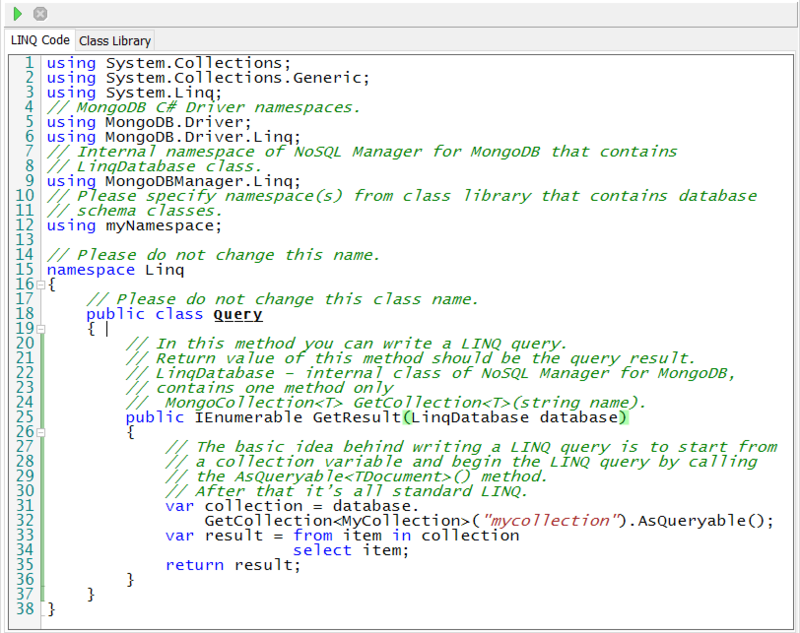 With LINQ Query Tool you can interactively query MongoDB database using LINQ. Moreover you can execute any C# expressions and statements with this tool. LINQ Query Tool is designed for C# developers. It is the best and the fastest way to create and check LINQ statements for your .Net projects. How to use LINQ Query Tool? 1. To start LINQ Query Tool connect to a database and click Tools|LINQ Query in the main menu or LINQ Query icon on the toolbar. 2. After that you see the following code snippet. 3. Next you need to specify .Net class library that defines your database structure. 4. After that specify namespace there your classes are declared. 5. 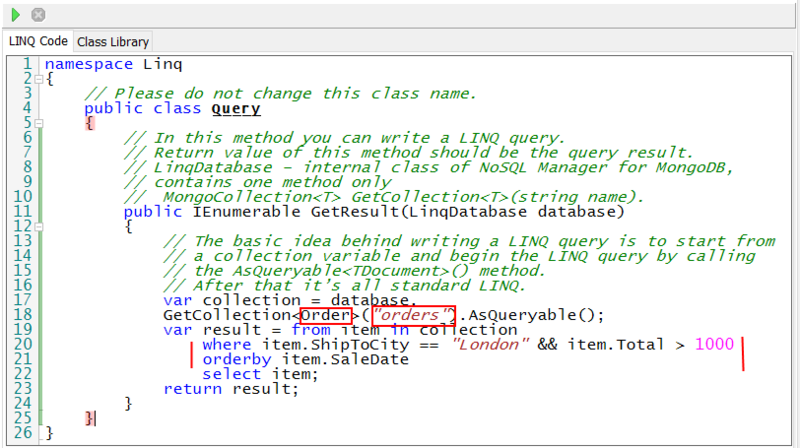 Next specify your class name, the corresponding collection name and a LINQ clause. TDocument – name of a .Net class you want to map data to. 6. Just press F5 key to execute an expression and fetch result. Example: Create simple LINQ query. where C:\Program Files (x86)\NoSQL Manager for MongoDB\ is an installation folder of NoSQL Manager for MongoDB. LinqSample.dll library contains one class used for mapping to the orders collection documents. 3. Next go to LINQ Code tab and paste the code below to the editor. // MongoDB C# Driver namespaces. // Please do not change this name. // Please do not change this class name. // In this method you can write a LINQ query. // Return value of this method should be the query result. // After that it’s all standard LINQ. 4. Press F5 key or click Execute button on toolbar.